Hopping into town just in time for Easter are these adorable Organic Rabbit Rattles! These sweet little rabbits are handmade in small batches with organic and sustainable materials by Dress Me Up. Each rabbit rattle is stuffed plump with naturally anti-bacterial lamb’s wool, offering a warm, springy and utterly soft tactile experience for your baby. Rattles are filled with wooden beads surrounded by a protective padded casing. The casing provides a gentle rattling sound and keeps the wooden beads safely concealed from little mouths. Each one-of-a-kind rabbit is adorned with its own unique cursive, free-form stitching embroidery and makes a thoughtful organic, one-of-a-kind Easter gift. These rattles are so sweet, a perfect size for baby's hands, and the rattle noise is soft and soothing. Plus you get to support a sweet mama-crafter who does great work! 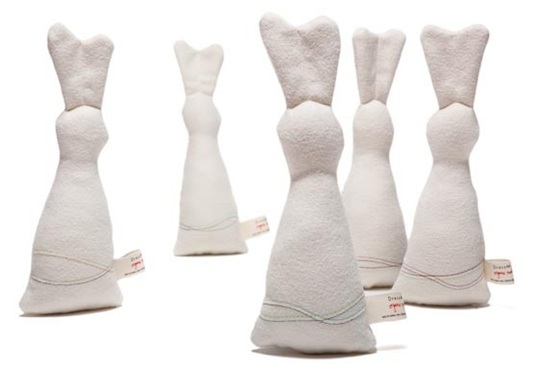 Hopping into town just in time for Easter are these adorable Organic Rabbit Rattles! These sweet little rabbits are handmade in small batches with organic and sustainable materials by Dress Me Up. Each rabbit rattle is stuffed plump with naturally anti-bacterial lamb's wool, offering a warm, springy and utterly soft tactile experience for your baby. Rattles are filled with wooden beads surrounded by a protective padded casing. The casing provides a gentle rattling sound and keeps the wooden beads safely concealed from little mouths. Each one-of-a-kind rabbit is adorned with its own unique cursive, free-form stitching embroidery and makes a thoughtful organic, one-of-a-kind Easter gift.